Tag line: "The Most Awesome Thriller Of All Time"
In 1933, a teenage boy walked into Graumann’s Chinese Theater on Hollywood Blvd. to see a movie, and by the time he emerged two hours later, the course of his life had been forever altered. The movie was King Kong, and the boy was Ray Harryhausen. The fact that King Kong was responsible for stirring the imagination of the cinema’s greatest stop-motion animator, the creative mind behind such classic fantasy films as Jason and the Argonauts and Clash of the Titans, is enough to ensure it a place of honor in the annals of motion picture history. Of course, the movie itself ain’t so bad, either. 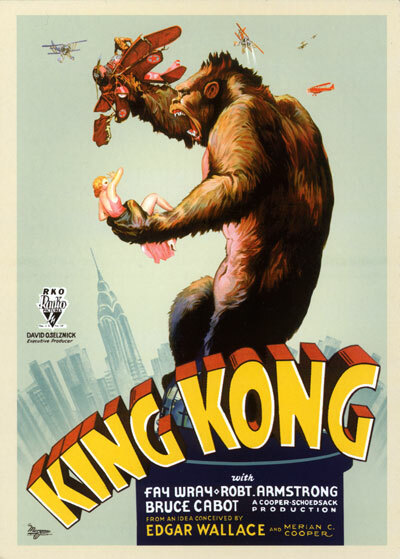 Directed by Merian C. Cooper and Ernest B. Schoedsack, King Kong opens on the docks of New York harbor, from which filmmaker Carl Denham (Robert Armstrong) and his crew, including new leading lady Ann Darrow (Fay Wray), set sail for a remote island that will serve as the backdrop for their latest adventure picture. But shortly after the troupe arrives at their destination, Ann is kidnapped by natives and offered as a sacrifice to Kong, a giant ape that carries the poor girl off into the jungle. The ship’s first mate, Jack Driscoll (Bruce Cabot), organizes a rescue party to save Ann, an undertaking that leads to the eventual capture of the mighty Kong. Figuring New Yorkers will pay a hefty sum to see such an unusual creature, Denham hauls Kong back to America and puts the beast on display. But things go awry when Kong breaks free of his chains and unleashes his anger on the unsuspecting citizens of New York. Forget the mediocre performances, or the fact the movie has very little in the way of an actual story; King Kong is all about the spectacle, and, for audiences in 1933, it must have been a sight to behold. Aided by the stop-motion artistry of Willis O’Brien, Kong causes all sorts of chaos, both at home and abroad. While on the island, Kong does battle with a variety of creatures, including a Pteranodon and, most notably, a tyrannosaurus (an exciting showdown that ends with Kong breaking the prehistoric beast’s jaw). Yet this is nothing compared to what happens when the gargantuan ape hits the streets of New York, where he topples subway trains and scales the side of the Empire State Building. Chock full of memorable sequences, King Kong has earned its reputation as one of the most influential fantasy films ever made. Yet another interesting aspect of King Kong is how its title character emerges as the most likable in the entire movie. A freak of nature who fell in love with the wrong girl, Kong was torn from his natural habitat so that he could be put on public display, and though he was clearly intended to serve as the film’s monster, it’s hard to see him as anything more than an innocent victim. Ray Harryhausen himself once said, “(Willis) O’Brien injected into a pile of rubber and metal joints far more sympathy and depth than was to be found in the real people on the screen”, and after watching King Kong, whether for the first time or the 20th, you’ll likely agree this observation is 100% spot-on. @SpiderParker: Thanks for stopping by, and for the comment! I'm always happy to take requests! Sometimes, it may take a while for me to get around to adding them to the blog, but I do try to watch movies that are recommended to me. Of the ones you mentioned above, I've already reviewed both KRULL and DARK CITY, and will certainly be reviewing the others (I absolutely LOVE the original TIME MACHINE, and am a big fan of TIME AFTER TIME and the original CONAN THE BARBARIAN). Please feel free to list as many fantasy films as you like. Again, I love receiving recommendations! I've discovered so many great movies thanks to the suggestions of others. I never get tired of re-watching King Kong. One of my favourite films of all time. I'd also recommend Merian C. Cooper's 1935 Fantasy adventure: "SHE"
This is perhaps the most perfect film ever made. It is, to my way of thinking, pretty much flawless. This is why no one has been able to effectively remake it or duplicate it in any way.